Busting out into song when being driven to somewhere and all the drivers know the songs! The vehicle instantly fills with harmony & rhythm & when we pull up to a stop – people’s faces just LIGHT UP! 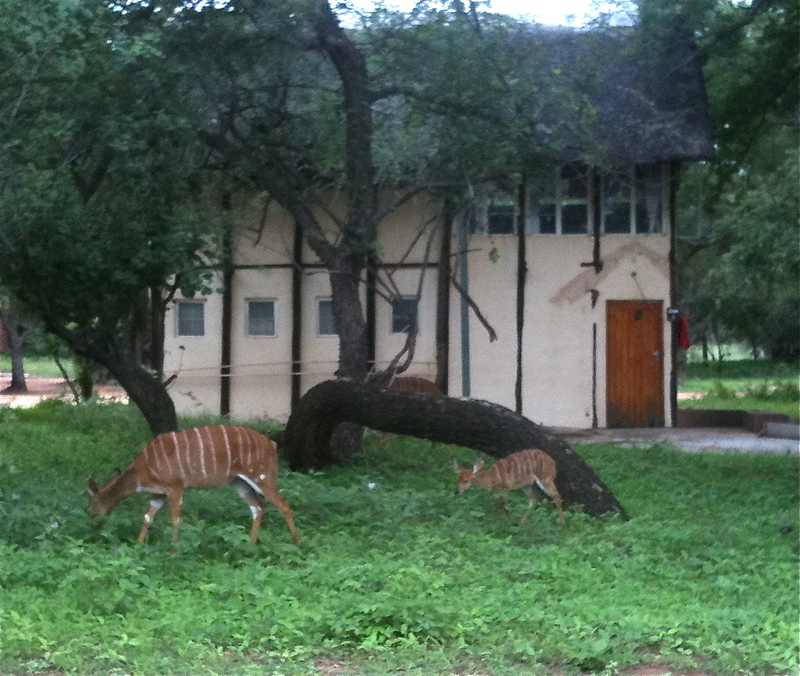 On the drive in we saw giraffe, impala, kudo, big moneys, water buffalo, & more unknown animals. The rich sonority and mellifluous quality of the multiple African languages flowing from people’s mouths. The polyrhythms of the birdsong in the morning and the dozen adorable small monkeys scampering through our compound! 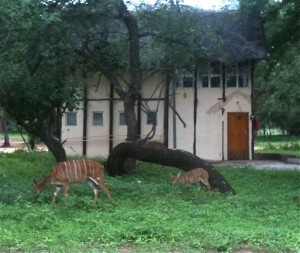 Impala grazing on the lawn at Dynala Nature Reserve where we rehearsed for a week. The huge orange spider that appeared in the dining room last night. The poisonous jumping snakes that live here and that we hopefully won’t encounter. The kitchen for the whole facility with only TWO very dull knives. Rehearsals begin this morning and we’ve got some great songs! I think we crammed about a week’s worth of living into one day yesterday. We learned TWELVE songs in 3 rehearsal sessions, including 5 South African songs, one of which has a stratospheric soprano line on top of a rock bottom bass part – amazingly huge sound altogether. As the sweat rolled down my belly and the room throbbed with energy that erased our exhaustion, I knew we had indeed arrived. Our South African teacher, Matlakala, is more animated and excited than I’ve ever seen her! And with a section leader from her choir in each of our sections, they just lift and carry the entire group along. What a thrill! Besides the singing, the kitchen turned out 3 tasty meals (I did lunch). There was time for a long relaxing swim in the pool in the afternoon and fun storytelling in the courtyard over a beer in the evening. Damn near a perfect day in my book! Hiding from the wildlife at D'ynala. We’re now emerging from our little cocoon at D’Nyala Nature Reserve and officially beginning our 2-week performance tour with a concert tonight. 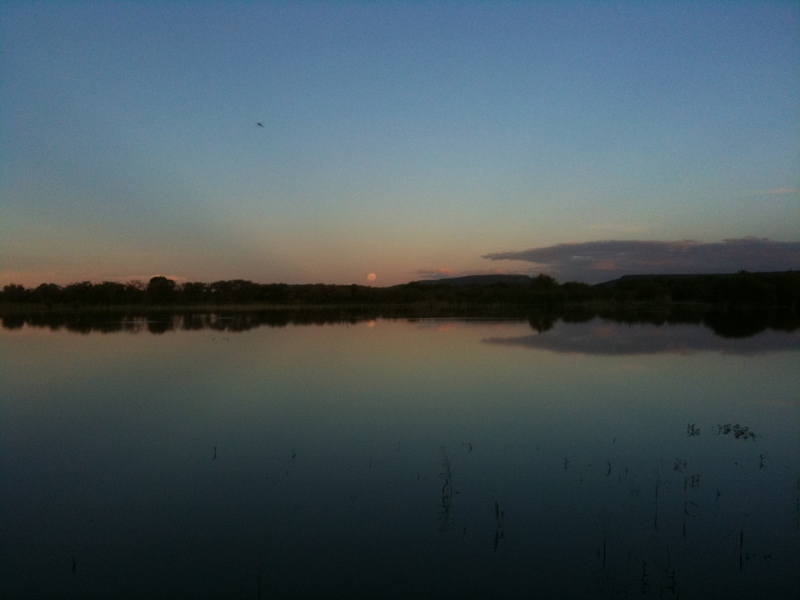 At the moment we are speeding across the lush savanna under a wide-open sky and enjoying perfect temperatures. It’s the rainy season, with cooling showers most afternoons. The full moon, absolutely the fattest, most luminous orb imaginable, rising over a shallow lake, perfectly framed by a notch in the distant hills. Evening swims in the moonlight. The traditional “braai” or barbecue we ate one night. Beef, sausage, & chicken with “pap” (what we call grits). I felt right at home. Teaching the South Africans, Brits, and Europeans in the group the finer points of American gospel singing style. The dance troupe of young adults who visited one evening and performed amazingly intricate rhythmic patterns in the “gumboot” style and other moves that imitated animals. They graciously invited us to join them in dancing. Most folks declined, but yours truly and a few other brave souls accepted. Fortunately, they simplified the steps and I thoroughly enjoyed myself. 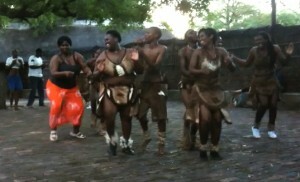 People showered me with praises for my dancing & I wasn’t even sore after leaping and stomping on the brick courtyard! 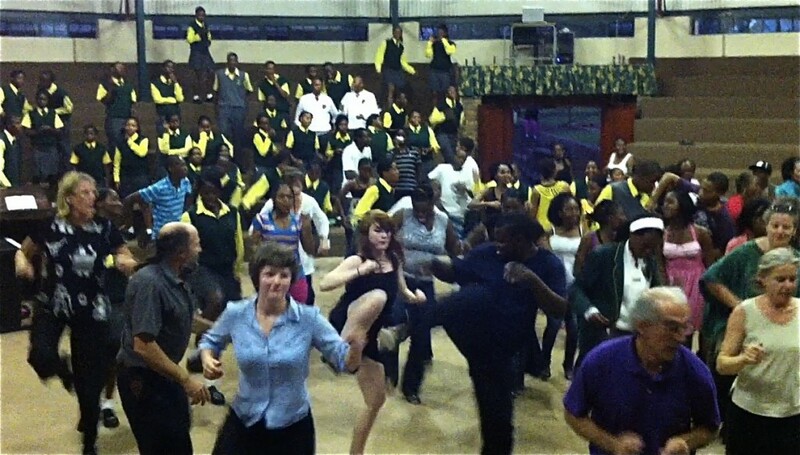 South Africans showing off their dancing chops. But the peak for sure was when we started singing our South African songs for them. These young artists were so appreciative of our singing. They all joined in and encouraged us so much with their enthusiastic response. It really boosted our confidence and our excitement! That said, half the sections still don’t know their parts, soloists are a bit tentative, languages are mushy (there’s 10 different ones in the program), basically we’re somewhat raw. But that’s how Village Harmony does it. I know that time, and the distinctive heat of the African’s joie de vivre, will deepen and sweeten all the flavors of this complex dish. And food is never wasted here. First 2 Concerts – Can It Get Any Better? South Africa, Jan. 23, 2011. 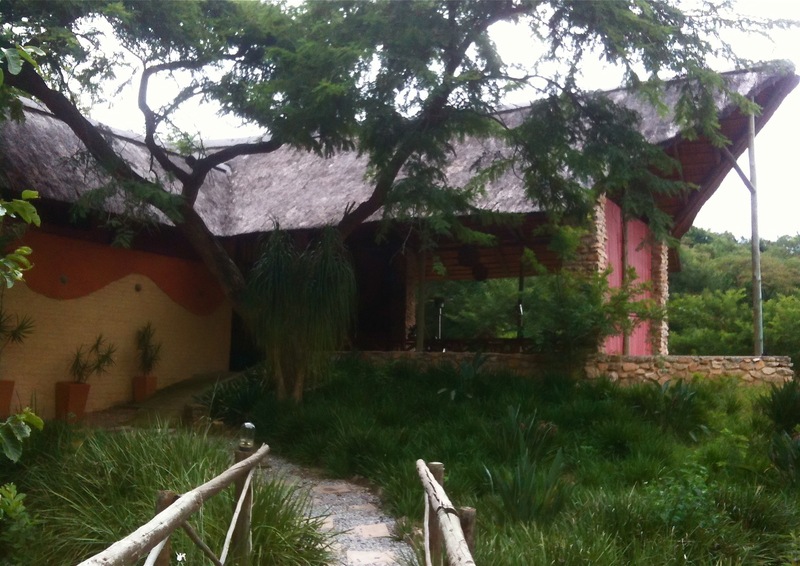 We arrived in Sheshego township to an enormous home-cooked banquet. After enjoying the meal and warm greetings from Matlakala’s (one of our leaders) relatives, we headed to her brother’s church for our first concert. As we pulled up to a plain brick rectangular building with a small sign reading “Pentacostal Holiness Church”, I knew we were in for an evening. The concert was, in fact, a fundraiser. Three choirs participated in addition to us. Each group sang their way up to the front when called and performed a short set. 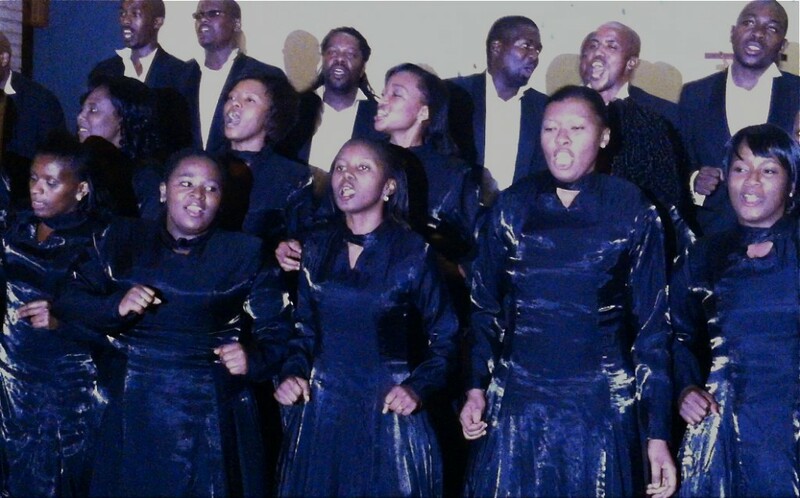 An adult & youth choir from the church and a sextet from a nearby academy, each in turn blasted the roof off the place with South African hymns, American-style contemporary praise songs (w/band), and artsy choral anthems. Our South African & American material went over well. Then the bidding began, where people put down money to hear the choir and song of their choice again. And thus multiple encores by request resulted in some cash for the church building fund. I think we could adopt this practice! The whole evening, 4 solid hours, felt very friendly, informal, and of course, spirit-filled. We departed sweaty, both depleted and enriched. After a chaotic distribution of singers to hosts in various parts of the township, we collapsed into bed anticipating the 5:30 am alarm for our next gig. The 6:30 am breakfast at Regina Pacis Roman Catholic church was little tunafish, liverwurst, & cheese & cucumber sandwiches. Thank God for the Nescafe! We filed in for mass at 7 am along with 600 South Africans, packing the large sanctuary. 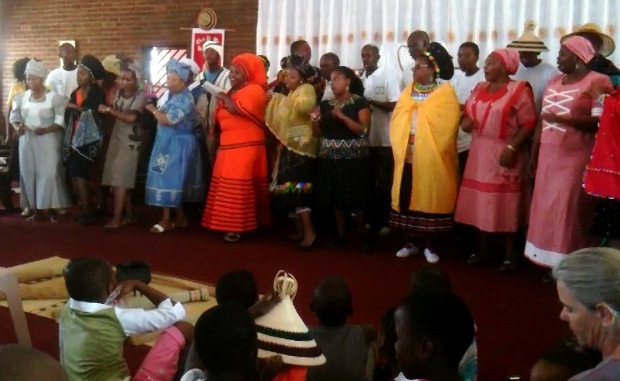 The familiar ritual, all in the Sotho language, lasted almost 3 hours, extended by nearly non-stop singing from the congregation & choir. Even the somewhat ponderous sermon was enhanced by a counterpoint chorus of birdsong! And I will never forget the “conga-line-greeting-of-peace” we experienced. People practically climbing over each other to touch us. Immediately after the service, the concert began with the church choir, then Village Harmony. And because Matlakala had taught some of the same songs to both groups, we also sang together a bit. After the long, exhausting evening the night before, short sleep, skimpy breakfast, and all morning in church, we were running on fumes at that point. It’s amazing how energizing the singing is though! We gave everything we had & were noticeably stronger musically compared to just 12 hours earlier. And we were totally uplifted by the congregation, as I believe they were by us. We emerged into the blazing sun again sweaty, exhausted, and elated, and were served a fabulous meal. The youth choir had lots more to share & they entertained us for another hour outside the church. Several of us knew some of their songs & couldn’t resist joining in. Here’s a video clip of the youth choir singing on the steps of the church. I realized we had just had two very intense experiences, quite taxing on many levels – physically, emotionally, socially – but so very rewarding at the same time. Yet these experiences seem relatively ordinary for the locals. There’s an intensity to the living here. And there is something vitalizing about being wrung out completely, so the fibers of your being become more absorbent for what life is. Our performance tour is in full swing now with one, sometimes two, appearances a day. Wonderful experiences are piling up on each other. I can only reach the surface in these notes. 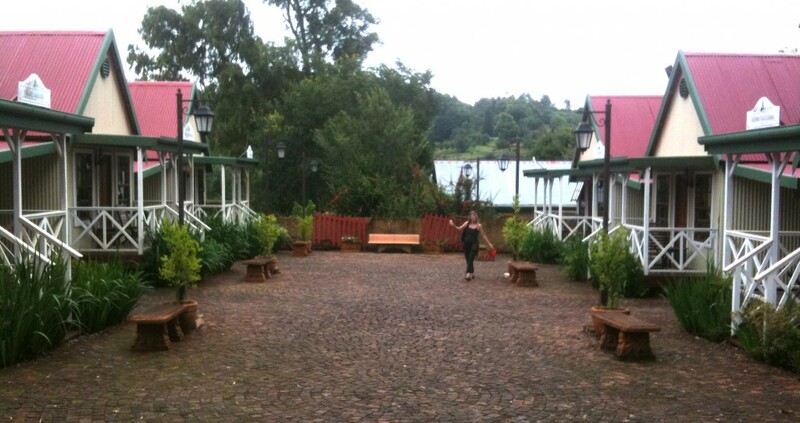 The resort hamlet of Haenertsburg was a change of pace. We passed through a canyon and into another climate. The area is mountainous & covered with pine forest mixed with eucalyptus. It actually reminded me a lot of Oregon. We drove past clearcuts, active logging operations, & a sawmill. The concert that night was our first for a mostly white audience. They were predictably reserved until we sang the song from New Zealand. It’s called Tiare Raoutonga, and is the greeting song sung when presenting leis of flowers to visitors on the island. There’s a sweet dance we do as we sing and the audience started mimicking us. After that, everyone loosened up & by the time the second South African set came around, they were even trying that! 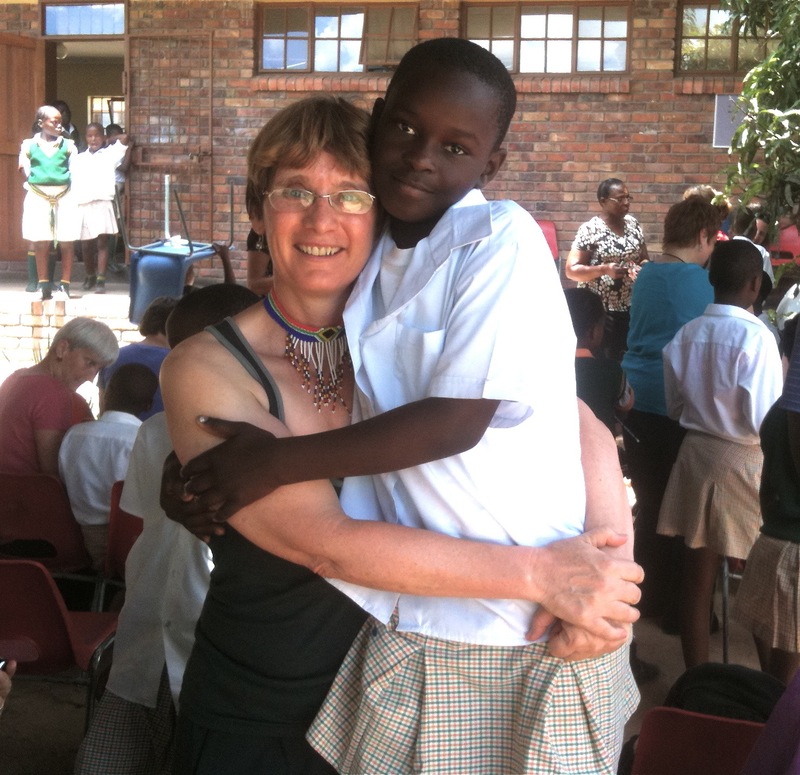 Great connections for future tours were made with 2 women who direct choirs – a white woman from Zimbabwe, and a black woman from the Eastern Cape in South Africa. People said our group could be on any stage in the country! They served us dinner, but it did not compare to how we had been feasted previously. Several of us were housed that evening in a row of adorable little vacation cottages typically used by visitors enjoying area’s outdoor recreation opportunities. After sharing wine & song with our hosts, we all settled into the luxurious indulgence of our accommodations. The next day, one of the locals led us around for some sightseeing. We had lunch at the village pub where my fish & chips was excellent. I asked our guide to tell me more about her hometown since it was in a region we would not be visiting. Her reply quickly degenerated into a bit of a rant about how the blacks have ruined the beach, etc. Just a string of stereotypical condemnations with the disclaimer “there are a few good ones”. Frustratingly, there was not an opportunity to explore the topic further, but it was definitely an authentic cultural encounter. Our next concert was for an officer’s unit of the SA army. Someone dropped the ball & they weren’t ready for us. After a short delay, we performed anyway to an enthusiastic crowd. One gentleman was very moved and wanted to find out how his daughter could join. He said a million rand would not match what we had given him with our singing. Lunch at the army base was hastily arranged by one of the officers & we ate hot deli items from a grocery store off of paper napkins. 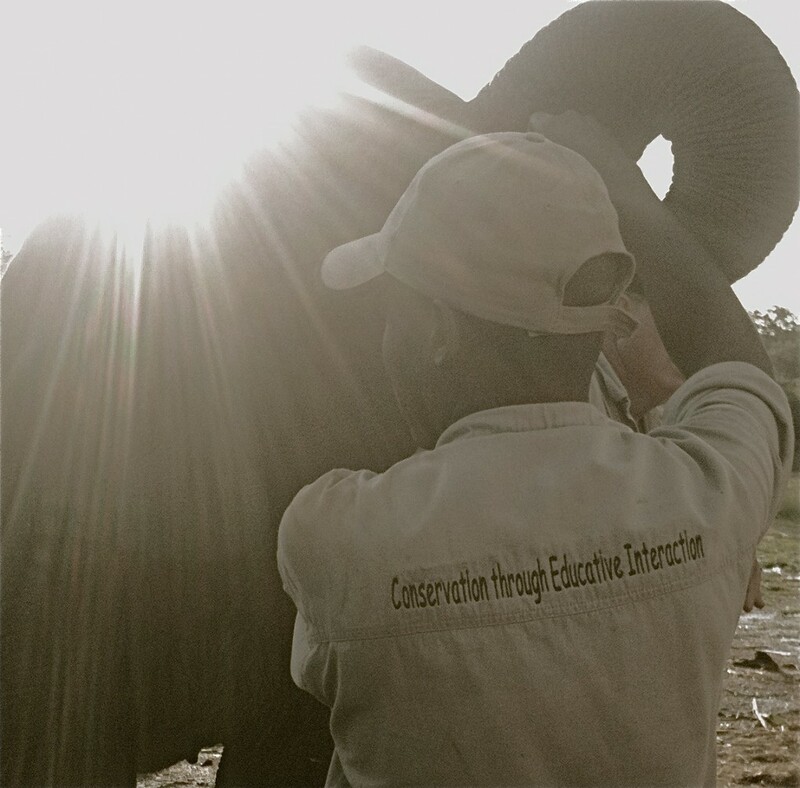 Then we hit the road to visit an elephant rehab & training center whose mission is Conservation through Educative Interaction. The director was so knowledgeable and passionate. And the elephants were totally awesome. I learned a lot. Then, we had a series of concerts at different schools. That’s the next installment. 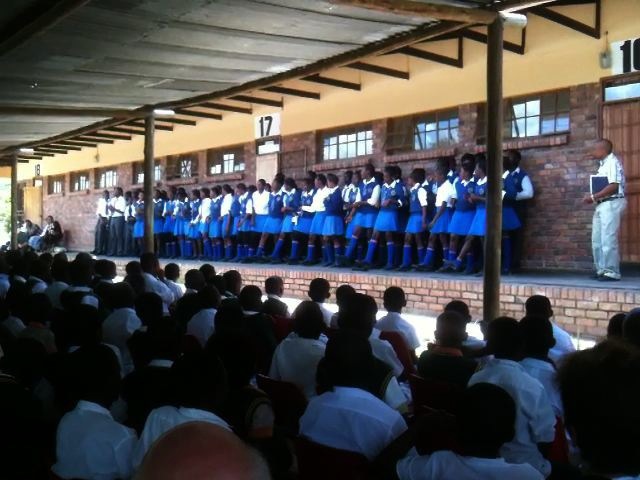 School Concerts, South Africa, Jan 28th, 2011Our first school concert was at Helen Franz School for the disabled. 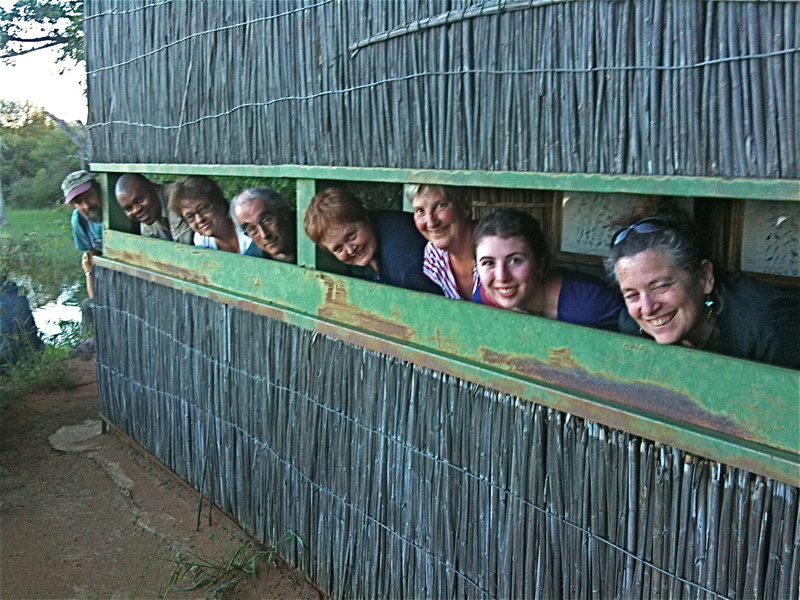 Village Harmony always sings there when they tour South Africa & we were greeted like old friends. It’s a huge residential facility for hundreds of students of all ages and all types of physical disabilities. The program alternated between speakers, VH songs, a choir of staff members, selections from the school band, and a dance demo by a wheelchair couple and another girl & boy, she with no hands, he with a spine so distorted you wondered how he could stand, let alone dance. Every program transition, and there were many, was marked by a chorus or verse of a song. The room would fill with harmony as one group came to the front and another returned to their seats. What a difference that makes! This is another practice I wish we would adopt. The overall message of the program was to strive and achieve as much as possible regardless of disability, and the member of our ensemble who is blind was a real inspiration for them. The next day we had a double-header at two private boarding schools, both former white-only institutions, now mostly black. The morning gig was at Settlers Agricultural School where students specialize in learning modern farming techniques. These skills are critical if land reform (transferring ownership to black Africans) is to succeed in this country because it’s been 3 generations since the native farmers had access to their land. Again, we shared a program with the school choir. This group was student-founded and led by an amazingly talented young woman. A student at Settlers Agricultural High School leads the choir singing "Lean On Me". They performed several songs I recognized, which was delightful. We were enthusiastically received as usual. One teacher remarked about how wonderful the diversity of our presentation was – people of different ages, from different countries, singing in multiple styles and languages. That’s an eye-opener for folks here & one of the gifts we have to offer. On the way out, our youth contingent (6 young women) got into a vocal hip-hop jam with some of the schoolboys. That evening we pulled into Prestige College, which is really for grades 1 through about 14 (the matric level). As it was Friday afternoon, most learners (their word for students) were heading home for the weekend. After touring the relatively well-equipped facility, we were fed supper before the concert. The performance space was a round brick structure with amphitheater-style concentric benches elevated about 15 feet around the perimeter. It had a cone-shaped metal roof and it was HOT as an oven in there! When the marimba/jazz band came out and swung into a high-energy boogie-rendition of Amazing Grace, the mood really took off. Soon everyone was shakin’ their booty on the big circular floor together. Click here to see the dance happen. After the dance break, there was more song-sharing by both choirs, and by this point, neither group could resist joining in on each other’s songs – especially since we each recognized some of the other group’s songs. Pretty amazing since we thought we were worlds apart. It was a total blast. Afterwards, a small pack of girls guided me to the dorm where we were all billeted for the night. They giggled, called me ma’am (in a British accent), admired my dancing, and said they wanted to visit my country. Very sweet. The dorm was a bit spartan with sagging mattresses, a single sheet, and a scratchy blanket. We had to open all the windows for air, but there were no screens, so the mosquitoes had easy access. Thankfully, they buzzed more than they bit. All 22 women in the group were together for the first time, so we pulled up a bench, laid out all our various munchies, & poured what wine we had. It turned out to be quite a lot of wine and the fun continued far into the night. Many more South African songs were shared, including a teasing one about a woman with a figure like a Studebaker! That one is going in the repertoire for sure! Next, we’re back on the church circuit in both Pretoria and Soweto, and the contrast between those two places would give anyone whiplash. The pivot point in our tour schedule was the 3 days spent in South Africa’s richest, most populous province of Gauteng, containing Pretoria, the capital, Johannesburg, or eGoli (gold city), the economic center, and Soweto, the largest township and the political heart of the new South Africa. Here you sense everyone pushing to get ahead and the vastly different rates of advancement. Perhaps the most tangible indicator of this is the twelve-lane freeway between J’burg and Pretoria. “Rush hour” lasts from 6 to 10 am and from 3 to 7 pm. It’s truly chaotic with six lanes in each direction, crammed with all manner of vehicles. The first world recklessly rushes by on the right in air-conditioned BMWs, Mercedes & Lexus’ while the third world lurches and crawls along on the left in tiny pickups jammed with workers, sagging taxi-vans stuffed to the max, and heavy transport trucks laboring with their open loads. As you might imagine, collisions are common and disastrous. We quickly learned to stay in the middle lanes and kept two people watching the road at all times in addition to the driver. It was the most stressful aspect of the trip. After the wine-soaked party the night before, I admit I welcomed the soothing luxury of the home of Norway’s ambassador to South Africa. 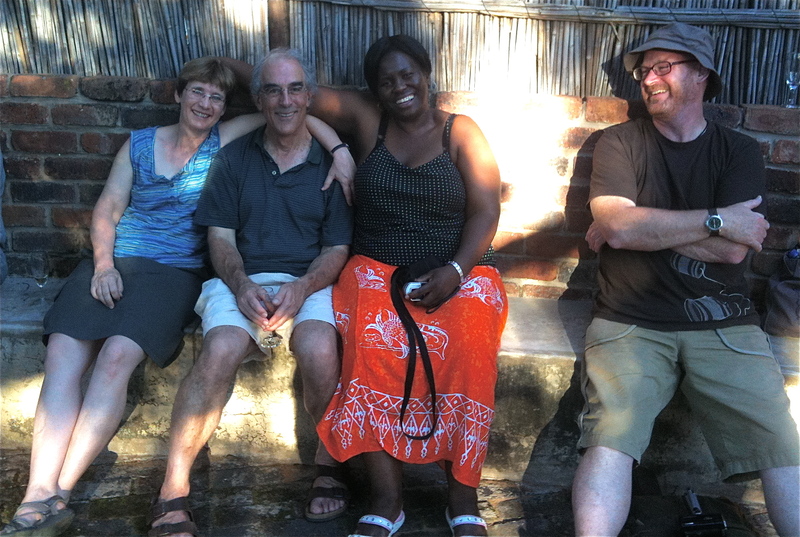 His wife Monica is singing with us & she has been a marvelous interpreter of SA cultural & natural history for us. 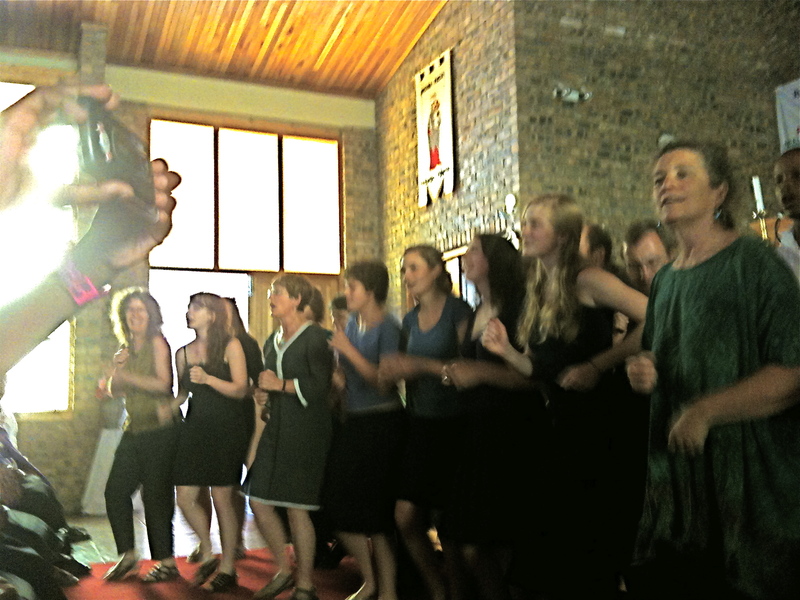 Refreshed by a half-day rest in that cool, comfortable home, we headed to a Lutheran church in Pretoria for our concert. Suddenly, as we rounded a bend, the famous Union Buildings where 20,000 women organized the first mass protest against the pass laws in1956 appeared in view, an imposing edifice on the horizon. It took my breath away to see it, just like when I saw a giraffe by the road on the first day, or the monkey perched on the deck railing of our cottage at the nature reserve. All these characters in my imagination were coming to life! We shared the concert with two church choirs. The adult group, dressed very formally in black, opened the evening with some European classical music. A baritone, tenor, and soprano sang operatic arias with keyboard accompaniment, and a chorus of about 40 powerful voices absolutely blasted their music at full force throughout. They were completely fixated on their conductor, who was indeed delightful to watch. Their delivery was not exactly nuanced, but the military precision of their breathing was impressive. It was an interesting echo of an entirely different musical universe. The youth choir was a lot looser and more folky and fun. They provided a good transition to our set. As is becoming typical, the enthusiastic, expressive response from the people hearing our music, especially the South African songs, energized us and lifted our singing to a higher level. Once again, the evening gradually evolved from a performance exchange, into a mutual celebration, ending with spontaneous mass singing and dancing in the lobby. We’re beginning to really like this! The the next day, Sunday, began with a light breakfast and an early departure for Soweto – a black township with 4 million people including millionaires in mansions, squatters in shacks, and everything in between. It was such a privilege to enter this community where so many key people and events in the struggle against apartheid originated. But we didn’t just enter Soweto, we were literally integrated into a congregation and community for 24 hours. We spent most of the day at a Methodist church in the middle of the township. By now, we’re getting more comfortable joining in with whatever is going on and we’re starting to sense how that signals our openness to and appreciation of the culture that is being shared with us so generously. As our reserve gradually melted in the glowing love emanating from these people, our energy flowed into the rhythm of the morning-long ritual. 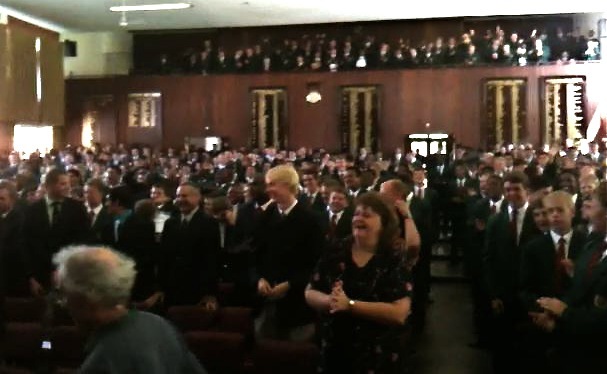 We sang, clapped, and danced with the congregation and witnessed a most electrifying sermon on the theme of empowerment delivered in 3 languages – Xhosa, Sotho, and English. The experience was another spiral of uplifting joy that erased our hunger and exhaustion. By the time we emerged into the blazing sun, we had been fully embraced by people we thought were complete strangers who seemingly lived a totally different existence on the other side of the planet. We were now bonded on a deeply core level. The abundant feast that followed was as nourishing to the body as the emotional feast had been to our souls. When the concert began, it was hard to imagine how one could go up from such a peak experience. Oh, but we did! Members of other congregations arrived and packed the small church after lunch as a wonderfully colorful choir opened the concert. Many of the singers, who were from different cultural groups, were dressed in their traditional costumes. It was a great example of South Africa’s other name, “The Rainbow Nation”. For me, this choir was perhaps the most exciting group we heard. There was something about the diversity of age and ethnicity, and their pride, confidence, and skill that was very appealing. They opened with a fabulous welcome song that I hope to have in my repertoire some day. What we heard was surely the tip of the iceberg with this group. Next was a male ensemble that’s famous in South Africa. I imagine they do highly polished performances in other settings, but this day, they were loose and relaxed. That was a good thing, because there was a pile of squirming kids on the floor in front and a little girl alternately hanging from my back and bouncing in my lap. Their lead singer was a totally captivating dancer and I’m looking forward to studying his moves on the video I shot. When it was our turn to sing, the atmosphere was very buoyant, yet everyone was attentive to what we had to offer. They really listened closely to every song and genuinely appreciated some of the unusual sounds we shared, like the Bulgarian village song with its thin, piercing timbre. Of course, their response to our South African material was huge – like swelling waves on the ocean. When both choirs joined us for the final songs, we were crammed into one pulsing, ringing, rhythmic mass and it was heaven – just heaven. 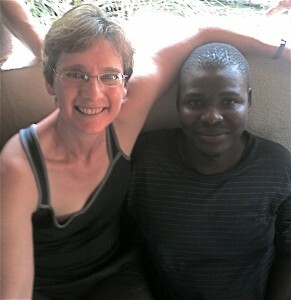 By late afternoon, when we were formally introduced to our hosts, we felt like we already knew each other. A planned excursion to a craft market had to be dropped due to the late hour, but that was replaced by a long intimate evening with our new families, sharing the ordinary details of their lives – watching their TV, eating their food, washing up in their bathrooms, sleeping in their beds. It was some kind of miracle, like finding a whole new side of your family you had only heard about in legends. Everyone’s experience was different, but I think everyone’s experience in Soweto was transformative. 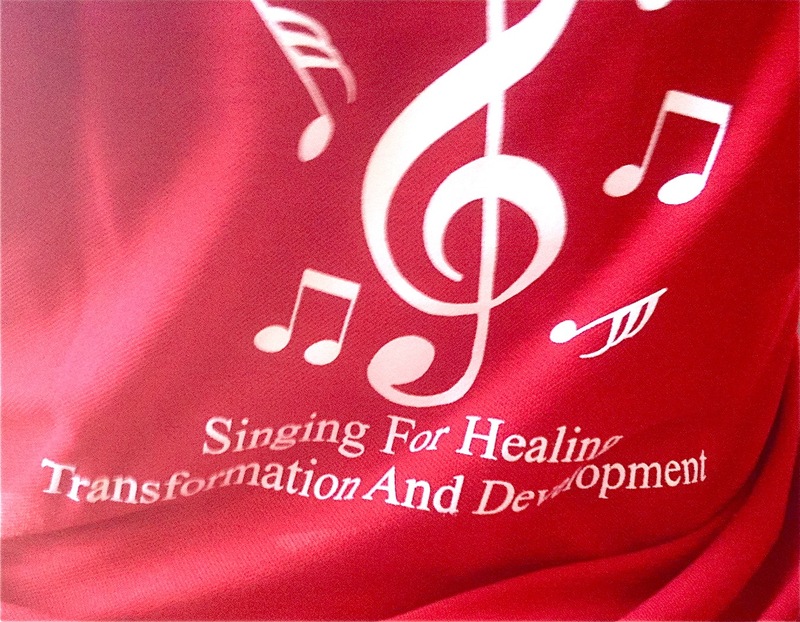 Choir T-shirt in Soweto: "Singing for Healing, Transformation, and Development"
How appropriate it was that the next morning we drove to the Cradle of Civilization, where some of the oldest human remains have been found, and there we contemplated how directly related we all are. 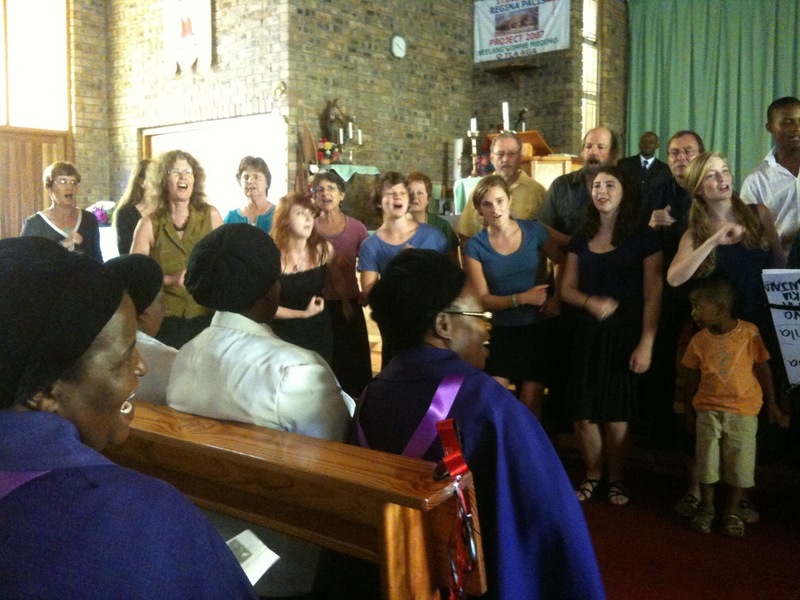 After visiting the Cradle of Humankind we returned for another concert at an Anglican church in Pretoria. We arrived hungry with the understanding that we were being fed dinner before the concert. There was either a miscommunication or a completely different concept of what constituted a meal for 31 singers, but the skimpy assortment of nibbles offered left more than our stomachs growling. The contrast with the delicious home-cooked meal we were served in Soweto was painful. And it was one of very few concerts where no one shared the performance with us. Between that, and the lack of food, I felt distinctly undernourished. Nevertheless, we sang well and the small audience enjoyed it. Security is a big deal throughout South Africa, but Pretoria was memorable mainly for the extreme security we encountered everywhere. Gates, guards, high-voltage wires, barricades, bars, alarms, dogs, guns, even bioscans – you name it – system upon system was erected to keep the have-nots out of what the haves have. It’s a force-field built around class more than race – an astounding amount of resources expended on protecting property. The country’s electrical grid can barely supply enough power to keep mines and other industry operating, but how many watts were sizzling 24/7 in the wires atop every wall? You get the sense that if the electricity failed for more than a day, the place would be completely under siege and would quickly fall to invading hordes. By sundown, the affluent neighborhoods are utterly deserted, their residents withdrawn behind the barricades. It felt like an eerie inversion of America’s sundown laws, where blacks were not allowed to be out after dark. But these residents are confined by choice. If the strongest jail is the one you lock yourself in, this place is iron-clad. Yes, the crime is real, and certainly scary, but the solution is sad. What good is wealth in a state of lock-down amid a world of deprivation? 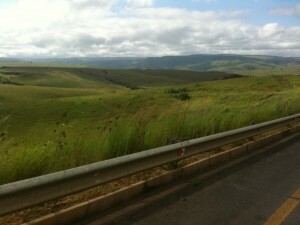 After an inspiring and informative visit to the Apartheid Museum, we headed east toward the lush province of Mpumalanga. 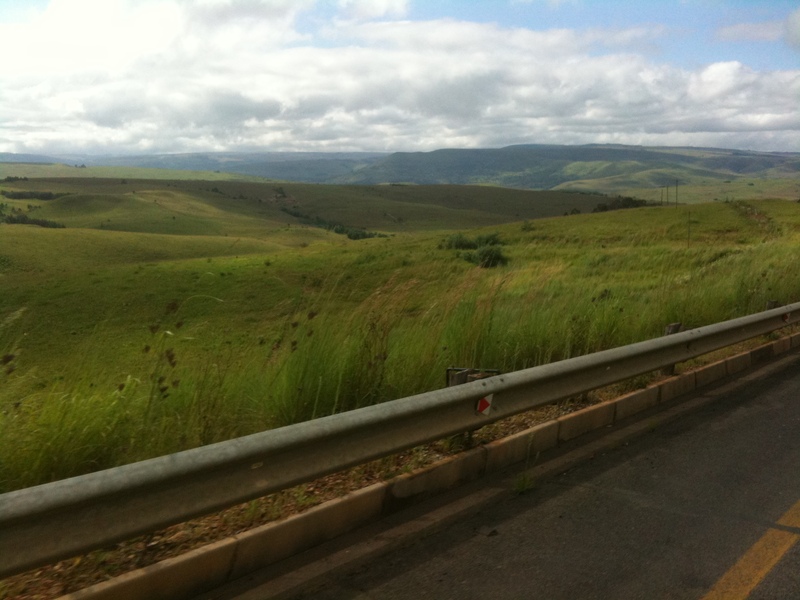 I was happy to escape Pretoria and hit the road. Beyond the polluted industrial town of Middleburg, the landscape gradually took on more grandeur. Nightfall caught us before we reached our destination (a farmstay at a place that grows oranges and macadamia nuts) but the frequent signs advertising trout fishing gave me a good idea of what was behind the curtain. The farmstay was different and fun. We were all in various tents and cabins near a pond. Even though the proprietor mistook one of our South African singers to be our “taxi driver” (oops!) she served a good breakfast with the best bacon I’ve ever had, and I ate like a pig. There were many ways our group may have challenged people’s assumptions, usually indirectly, and I hope this made some small positive impact on the country in exchange for the huge positive impact it was having on us. Our morning gig was at a school in a very low-income rural area, where one of the singers touring with us was soon to begin a teaching assignment. There were hundreds of students, but no auditorium, so everyone gathered under a large metal roof with chairs set up on the dirt. A couple of student choirs sang before us, then our group processed up onto a cement walkway with a brick wall behind us and sang for all we were worth to a sea of eager young faces. 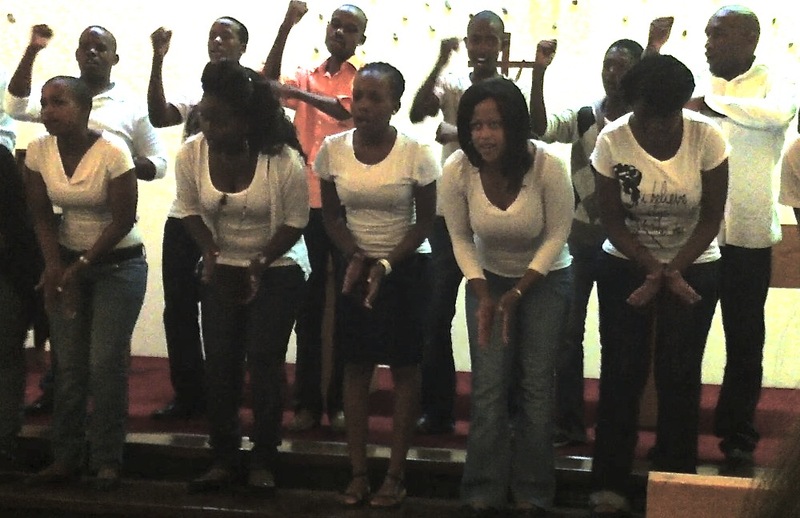 Here’s video clip of us singing I Themba Lami, a very well-known hymn/struggle song. It’s a bit shaky because I’m filming while dancing, but you can tell how the young people are responding. Look for the group gathered in the back under a tree as the camera pans to the right. Behind the students, a gorgeous hillside of green shrubs and sandstone outcrops formed a beautiful backdrop. Off to the side, I noticed several tables under a shade tree where a dozen women were laboring to prepare lunch. As we sang & danced, I watched their body language gradually metamorphosize from drudging to celebratory, and felt deeply gratified to be able to lighten their labor. Afterwards, we were each matched up with a child from the school to exchange names, and hopefully maintain a connection to the place. The name I exchanged with this young girl, Nothando, means “love”. And that pretty much says it all. Later that evening, we pulled into the Salvation Army hall in the picturesque town of Barberton just as the sun was setting and the surrounding mountains were aglow. And those are not just any mountains, they’re some of the oldest exposed rocks on the planet, 3.5 BILLION years. They’ve even discovered a bacterial microfossil, 3.2 billion years old, the first form of life on earth. Dang! Could this really be where the whole crazy party started??? I’d believe it because they know how to party in Barberton. For the concert, there was a charming little brass band (of course! 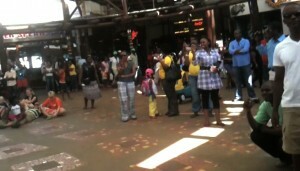 ), a raucous gospel choir, a Swazi family band of singer/dancers, and us, oh and the “audience”, who were definitely a big part of the party. Even though this was the second gig of a double-header day, and there had been many hot miles in the vans, I was charmed by the place and eager to get a groove on with this crowd. By now, I knew what was coming. I suppose there was an order to the evening, but it quickly flowed into a free-form fun-for-all, again filling up everyone’s cup with overflowing joy and vitality. I think I could, and willingly would, live on this. Our final destination of Durban turned out to be a 15-hour drive away, but it was a fitting finale for an amazing journey. The road trip to Durban was an odyssey by any standards. GoogleMap predicted an 8-hour transit time, but in reality, it was double that. We had lots of opportunity to appreciate the vastness of the grasslands while waiting for our turn to pass slowly through innumerable road segments that were under reconstruction. I thought about how contested this grazing land had been over the centuries, not only between European and African, but between Zulu, Sotho, Swazi, and other natives. I wasn’t sure what to picture in terms of original settlement, but now it appeared nearly uninhabited. There must have been livestock somewhere, but we didn’t see much, or much evidence of cultivation either. The openness reminded me of the American west, and the history did too. In both cases, the native population was squeezed onto tiny reservations of marginal land. But in America, the conquerors became the numerical majority, while in South Africa, they remained a tiny minority. Every couple of hours we passed through a small town, each with that peculiar South African double-sided geography – white on one side, black on the other. We gradually fell farther behind our expected timeline & had only made it as far as Ladysmith (of Ladysmith Black Mambazo fame) by dinnertime. I Googled a grocery store in Ladysmith (thank God for the iphone!) & we made a pit stop for provisions. The store was in a nice shopping center, but inside, it was rather dismal. It wasn’t very well stocked to begin with and was pretty picked over by the time we arrived. Plus, it was really chaotic with masses of people elbowing to get what they could before it closed. Not good if you’re already exhausted, hungry, disoriented, and have miles to go before you sleep! We had to improvise fast. I had noticed a restaurant nearby and threw out the idea of ordering take-out for the group. It seemed like the best solution so I was dispatched to do it. I ordered fives of this and that off the appetizer menu in hopes of getting the order fast, meeting everyone’s dietary needs and restrictions, and not spending a fortune. When the food arrived, it was obvious eating it the vans was not an option, so we ended up devouring our take out in the restaurant. They didn’t seem to mind and we left a good tip. Most importantly, we were revived for the last 3-hour leg of the trip. We survived the night ride through the Drakensberg mountains, but that’s one part of the trip I would not want to repeat, and not just because we missed some spectacular scenery. Even though we were on a divided highway, our little vans were pinned up against the longest convoy of heavy freight trucks I have ever seen. It went on for miles, seemingly for hours, bumper to bumper trucks crawling over the pass and slicing down the other side, bound for the biggest port in Africa. Getting around them involved forays into the fast lane where sedans swooshed up behind us and tried to squeeze past. The only blessing was it wasn’t raining. But Durban was worth it! We had three nights in timeshare units on the beach making the last part of our tour feel like a bona fide vacation. Sunrise over the Indian Ocean was gorgeous and the weather was sunny, warm, and breezy. I think the chance to unwind with that infinity-feeling of the ocean did everyone a lot of good. 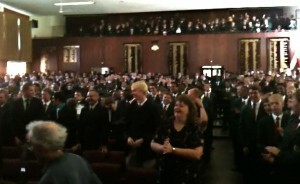 We gave a morning concert at an upscale boys school right in the heart of the city. The student-body was the most racially-mixed of any we had seen, both black & white and the whole spectrum in between. Their small choir started with some quasi-R&B style songs, accompanied by classical guitar. Then it was our turn to do our thing for hundreds of adolescent males. When the young females in our group strutted their stuff, the excitement in the room became rather — elevated :). But it was our South African songs that really got them out of their seats. The black students responded spontaneously like all the other audiences had, jumping up, joining in, dancing and interacting. Then they became self-conscious and noticed they had transgressed some protocol of decorum. Dutifully, they sat back down and tried to act like gentlemen, as they had no doubt been trained to do. I think our appearance may have produced an “ah ha” moment at that school, perhaps a sense that it was time to let in some fresh air to clear away the residual stuffiness. The school’s music director was eager to know more. He said his students were craving world music but he didn’t have resources or experience to teach it to them. And the headmaster wanted to have us back. I really believe if we taught a day-long workshop at that school, and equipped them with the excellent teaching resources Village Harmony produces, it would be a catalyst that could transform the school culture in a positive way. I hope that’s on the agenda for the next tour. Our last performance was a perfectly wacky one at Ushaka Marine World, a big theme park right on the beach. There were tons of attractions, distractions, & action of all kinds going on, and all kinds of people swirling around enjoying it. We finally found out a few minutes before the start time that we were singing outdoors at one of the intersections of the shopping-corridor part of the complex. Oh, and the muzak sound system could not be altered and would remain on! Laughing at the absurdity of it all, we assembled, like one of those flash-mobs you may have seen on YouTube, and started belting out one of our South African songs. Sure enough, people were captivated. An arc quickly formed around us and out came the cell phones and cameras. What a fine way to end, with an anonymous, unannounced offering to an appreciative random assemblage of the Rainbow Nation. It was a gas! I signed up for this trip knowing it was going to be rich. And knowing that, as much as I love the music itself, (and I do LOVE it), there’s much more to be shared than music. The music is a kind of magic key that unlocks a treasure of intangible cultural gifts. One of those gifts, for me, is the call/response rhythm, not of the songs themselves, but of something inherent in the singing context. There seems to be a fundamental cultural approach to gathering that invites exchange of expression, and uses it as a dynamic engine to generate energy. And that energy is a miraculous gift that keeps growing with the giving. This awareness has deeply influenced my understanding of the music. Intellectually, I knew it was all about connection, but now I’ve experienced it emotionally and physically. It’s going to be challenging to replicate it somehow in my teaching, and I don’t even know if it’s possible. I’m just blessed with an opportunity to try. PS – 12 days after returning home, I taught a workshop in Ashland, Oregon. I wanted so much to recreate the feeling of joyful unity we had in South Africa. I think we’re getting there!